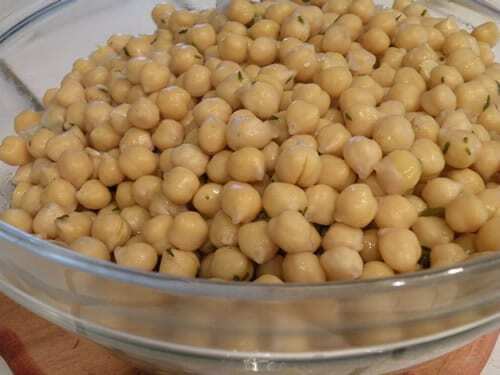 Chickpeas, often known as garbanzo beans, are a round-shaped legume with a light brown color. They have a firm texture, a light brown color and a mild nut-like flavor. They can be found cooked and ready-to-eat in a can, or dried, uncooked, in packages or bins at your local market. 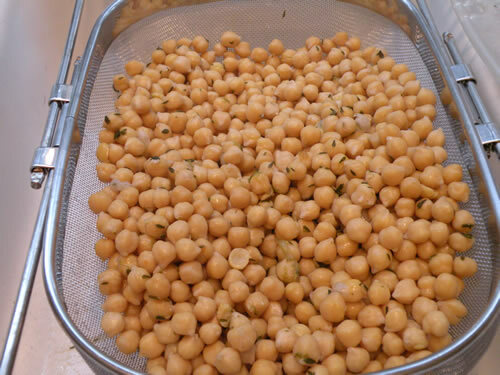 Chickpeas are featured prominently in the Middle Eastern cuisine; they can be transformed into many healthy and nutritious dishes such as hummus, falafel, and soups. Pulses, the category they fall under, are a great pantry staple, lasting up to six months in an airtight container. They are an inexpensive source of protein, making them a popular bean. In addition to protein they are a great source of fiber, iron, vitamin B and C, calcium — and may help in lowering one’s cholesterol. There are many reasons for making chickpeas “from scratch.” First is the unique flavor and texture you get that you would not get from the can. 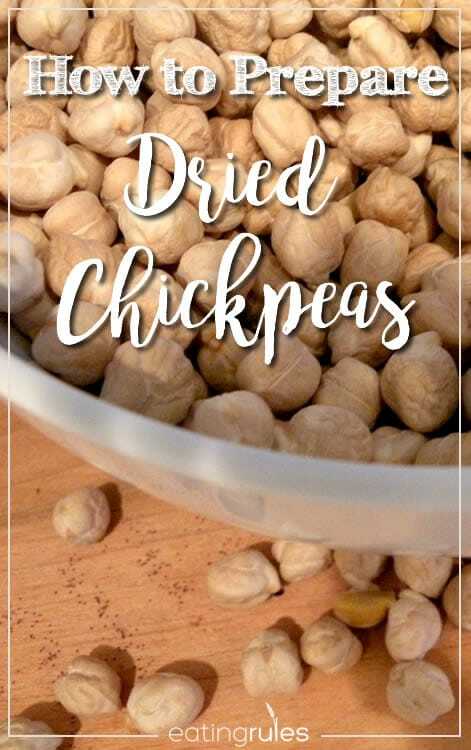 Home-cooked chickpeas have a soft outside skin with a creamy center inside. 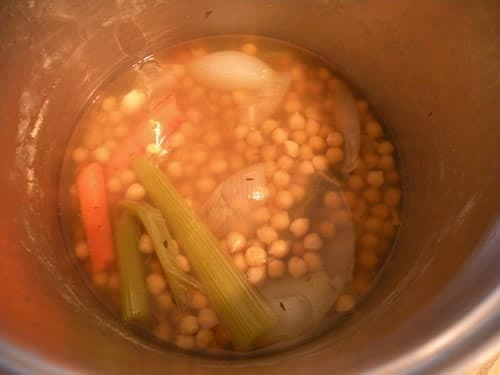 When you do open a can, you get that slimy juice that you must rinse and drain — and many times the chickpeas are mushy. You also have the ability to add as much or as little salt as your diet requires. A pound of raw, dried chickpeas costs about $0.79. Canned chickpeas run from $0.99 to $2.99 a can. Buying them from a bin and cooking them yourself is much more cost effective in the long run! However, dried chickpeas need to soak overnight, so you do need to plan ahead. Once they are cooked, you may freeze them in smaller batches to be added later to your salads and soups. The night before: Place the beans and cold water in a pot and soak overnight. The next day add all the ingredients to the pot, except the salt. 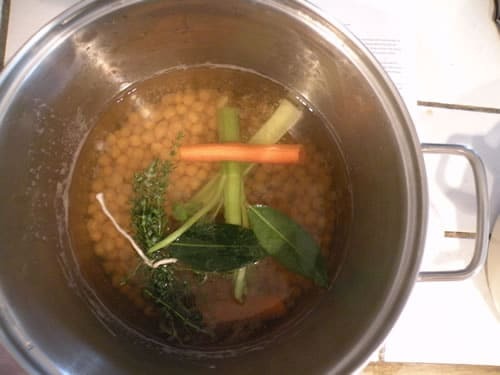 Fill the pot with more water, up to 2 inches above the beans. Boil and reduce to a simmer. Cook beans for 1 to 1-1/2 hours, until soft. As they cook, skim the white foam off the top of the beans. Check by biting into them; when they have softened remove beans from the heat. Add salt and stir. Cool. Remove all the vegetables and herbs. Drain. They are now ready for your recipe! 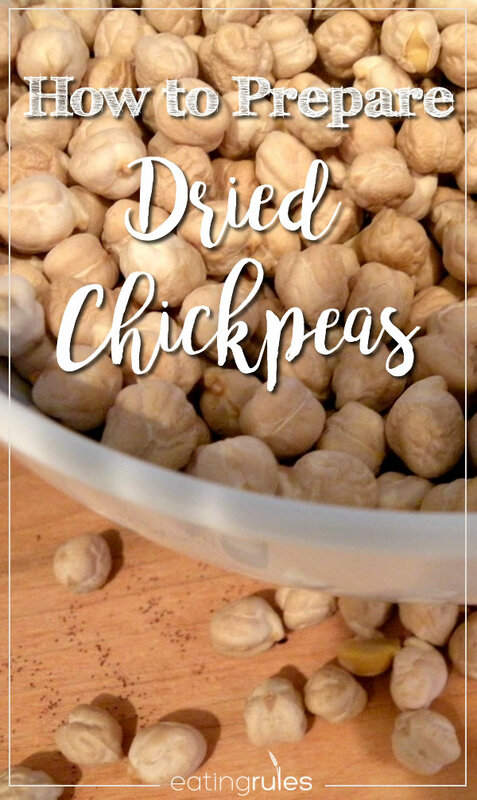 Mary has just posted on her blog three new chickpea recipes, which she prepared this week for October: Unprocessed. good timing on this entry as i just made hummus with canned garbanzo beans because i didn’t plan and soak them ahead of time. 😛 glad to hear they fare well in the freezer, so i can just make a bunch at once, rather than turn it all into hummus all at once. Great question, Xan — one that I would love to know the answer to, also (but haven’t had a chance to start researching). I’m guessing that the dried beans are less processed — because they’re so much cheaper. They also take up less space (therefore being cheaper to sell in a store with limited shelf-space), and certainly cost less to package and ship. So I’d assume — but I may be wrong — that the dried beans undergo less processing. Also, if the canned beans go through the same drying step, but are then cooked and canned, my vote certainly goes with the dried beans. (Three good reasons: You can control the sodium, they cost less, and there’s less environmental impact). Any chickpea experts out there know the answer? I might be wrong, but I think dried beans are cheaper because they’re less convenient, not necessarily because they’re less processed. I do this at least once a week (I do love garbanzos), but I use a pressure cooker. It makes it even easier and faster. I can cook them in 22 minutes from top pressure – easy peasy. I cook my own dried garbanzo beans because I don’t like the texture of the canned beans, plus it’s cheaper. But I just cook it plain without all the vegetables & herbs. Is there a function for the veggies & herbs or is it just for flavor?